Dan Russo had nothing in common with his first cousin except their lineage and the fact that they were both young. But one evening when his cousin told him about the scene in downtown Newark, New Jersey, a door to a secret world opened for Dan-a world that revolved around homosexuality, new experiences, and sexual freedom. Russo begins his memoir in the early sixties, in a time when the Waldorf Hotel was a bohemian hangout for such artsy characters as Mad Alice who was always semi-drugged, Miss Coppertone who dyed his hair red and spoke with a lisp, and Mafia Bob who was gifted with a raspy voice and wore a tiny hat. As Russo continues with a revealing look into his childhood when his bi-curiosity began, he introspectively shares what it is like to be sexually confused, hide the secret of your true identity from everyone, and then suspect that some might know anyway. " 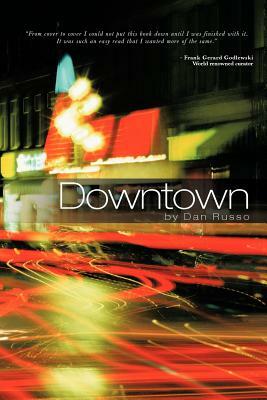 Downtown " offers a profoundly honest, chronological portrayal of one man's coming-of-age journey through both the bright and dark sides of life as he eventually discovers his own way to bring good to a troubled world.